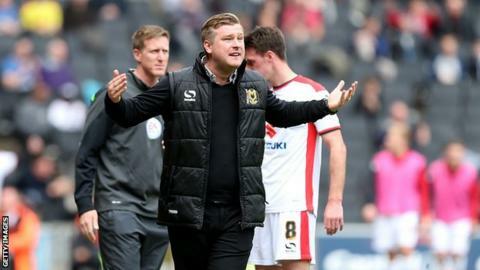 MK Dons boss Karl Robinson believes Capital One Cup first-round matches should not feature extra time. The Dons beat Leyton Orient 2-1 on Tuesday thanks to two late goals. "I don't think the first round of this cup should go to extra time," Robinson told BBC Three Counties Radio. "We get asked to play a competitive team on a weekly basis and for it to go to extra time at a time when no players are physically able to do it - we have to look at it." Tuesday's match at Stadium:MK looked to be heading for an extra 30 minutes when Orient defender Mathieu Baudry headed into his own net to make it 1-1 late on, but Carl Baker scored a 92nd-minute winner for the Dons. Robinson said: "We could have lost certain players through fatigue because most muscular injuries and a large percentage of injuries come through fatigue in the latter part of games." In the Johnstone's Paint Trophy, which features teams in League One and Two, matches go straight to penalties if the scores are level after 90 minutes. Robinson believes other managers - including Orient counterpart Ian Hendon - agree with him. He added: "We had three players who hadn't played a pre-season game. There were a number of players we couldn't play for various reasons. "At this stage of the season when you do Saturday, Tuesday, Saturday, Tuesday it's an awful lot of football and a big ask for any club."